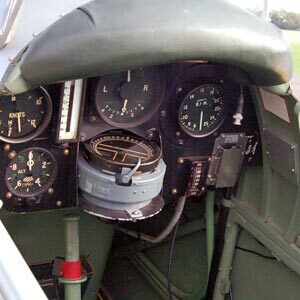 The DH 82 de Havilland Tiger Moth was a wood and canvas tandem cockpit training biplane with the student sitting in the front cockpit, it was designed by Captain Geoffrey de Havilland in 1930 from the existing 1925 DH 60x de Havilland Moth for the RAF as a primary trainer. The main changes to the earlier design were to make it easier for the pilots, especially the student pilot, to "bale out" when encumbered by a parachute should it be necessary, and to aid visibility used an inverted engine. To achieve this fold-down cockpit access doors were added, the fuel tank mounted on the centre of the upper wing on the Moth partially blocked the front cockpit exit, this was rectified by moving the whole upper wing forward with it's cabane struts and then fitting new swept back wings to move back the wings centre of lift to it's original position (these changes can clearly be seen on the above picture). The de Havilland Tiger Moth entered service in 1931 and by the time production ended in 1944 a total of 8,868 aircraft had been produced. Although built for the RAF who operated the Tiger Moth until 1952, it was operated by numerous allied air-forces most notably the RCAF, RAAF, RNZAF, USAAF and the RIAF. The last Tiger Moths to serve in a military role were a small number purchased second hand by the Royal Navy in 1956 and operated for three years as "target tugs" and "air experience" aircraft. As Tiger Moths were retired from military service they were invariably purchased by the numerous flying clubs, commercial concerns and individuals that came into exisance, as a result several hundred remain flying today and can be seen regularly flying throughout the world. This picture of De Havilland DH82a Tiger Moth is Copyright © June 2014 Siteseen Ltd. We only authorise non-commercial picture use and particularly encourage their use for educational purposes. This De Havilland DH82a Tiger Moth picture is not in the Public Domain. 3) Use of this De Havilland DH82a Tiger Moth picture, or any of our pictures on websites re-distributing copyright free material is strictly prohibited.